BBC’s Food and Farming Awards – get voting! Is there a cider or perry that you can’t live without? Do you want to tell everyone how great your local cider maker is? Here is your chance to get noticed by a wider audience as nominations for the BBC’s Food and Farming Awards are now open. This year it includes ‘Best Drinks Producer’ and you can even nominate yourselves! Nominations close at midnight on 14th of August. The annual awards in Herefordshire, coinciding with the blossom time event, had a good number of entries this year. The small scale cider makers that enter these awards had to pick from their collection of ciders and perries that had been fermenting over the winter.. Due to the long, extremely cold winter the fermentation of wild yeasts in the fruit had taken longer than usual. However, a fantastic collection of craft ciders were entered from Wales and the borders of Herefordshire and Shropshire – great to see a combination of real pro’s and newcomers to the awards.. The rules for the awards are here, should you want to enter next year – absolute novices are welcome! 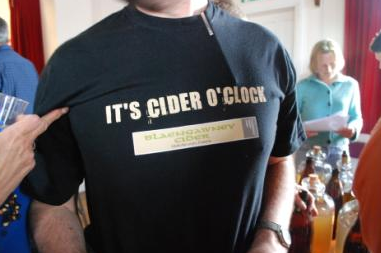 If you can seek out any of this award winning cider then you will not be disappointed. It’s always a pleasure driving up from South Wales to The Big Apple (Putley Cider Trials) because of the many orchards in full bloom on the way. This year was nodisappointment as the blossom was stunning. On arrival we saw the usual faces andhad a quick chat before booking our entries in. While doing that we were accosted by a Japanese film crew – a man who didn’t speak any English, and a woman who now livesin London, so her English was excellent. I suspect they were attracted by the fact that we had brought our very attractive 25 year old daughter with us this year and no doubtthey thought she would look good on the tele! Those queing behind to book their cider infound all this very amusing. We then set off to Ledbury where we always spend quite a while in the great kitchen shop there which also has a brilliant deli. We spent too much money as usua,l but discovered a lovely Chinese restaurant next door where we had an all you can eat buffet for £7.50. That filled us up nicely for the judging that was to follow. On arrival back at the village Hall in Putley there were a number of people standing outside the locked door. The look on Mike Penney’s (Troggi) face when he realised thejudges for the bottle conditioned perry were inside and judging when he was a judgewas priceless. He had to bang on the window and shout, asking to be let in. 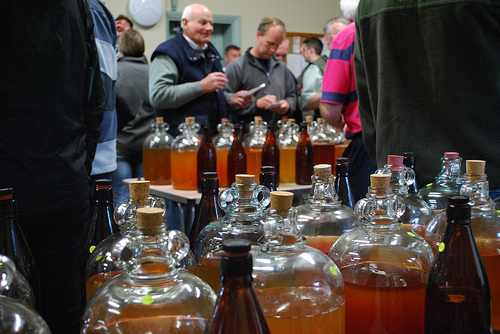 Once themain judging started everyone piled in and the array of ciders and perries were amazing. The different colours and hues were highlighted by the sun shining in the window. Andy got started on the Dry and Medium ciders, while Mairi and I jointly did the Sweetciders and perries. Mairi was a Putley virgin and she couldn’t quite believe what she was seeing….or doing. She had been given some ‘training’ by Andy on what to look for so was reasonably competent and by the end of the afternoon was extremely flushedand ‘happy’. That Japanese film crew kept following her round! The standard of entries was generally high and there were only a handful which were undrinkable. However, we didn’t find it hard to select the top three in each of thecategories. We were pleased with the day, especially getting a 1st for our Medium/Sweet Perry and a 3rd for our Medium Cider and if we don’t make the big time in the UK, Mairiwill be a cider-star in Japan! CAMRA’s National Cider and Perry Championships 2010 in Reading featured 24 ciders and 24 perries, selected from different regions of the UK. 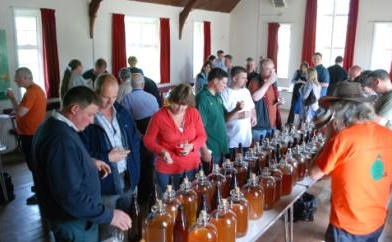 The ciders and perries are assessed on factors such as aroma, flavour, overall balance and finish by a judging panel consisting of publicans, drinks writers and CAMRA members. Lyme Bay Winery’s Jack Ratt Scrumpy cider has won the prestigious three Star Gold at The Great Taste Awards 2009 – the first ever cider to win this accolade. Named after Jack Rattenbury – a notorious Lyme Bay smuggler – it is available in a variety of sizes. This traditional, still fruity cider has a softness that is given to the flavour by having left the cider on the lees so a secondary malolactic fermentation takes place. The Guild of Fine Food, who organise the annual Great Taste Awards, say a three-star gold is the highest level of award any producer can aspire to and is recognised as the definitive independent accreditation of quality. The Guild is theUK trade association for anyone making or selling top quality local, regional and speciality food and drink. The 1,300-plus members include; delicatessens, fine food halls and farm shop, speciality food producers, from cheese-makers to chocolatiers, importers and distributors of gourmet foods from around the world,and suppliers of equipment and services to support the fine food sector. Using freshly pressed juice of locally grown, traditional cider apples such as Dabinett, Kingston Black and Yarlington Mill Jack Ratt Scrumpy is just one of the range of ciders available. The Guild of Fine Food have announced the winners for the 2009 Great Taste Awards and Welsh Brewers and Cidermakers have again done well in the competition. Gwynt Y Ddraig have walked away with 3 stars, the highest award, for their Vintage 06 bottled cider. They also received one star for their bottled Orchard Gold, as did Ty Bryn Cider with their Sweetened Sparkling Cider. 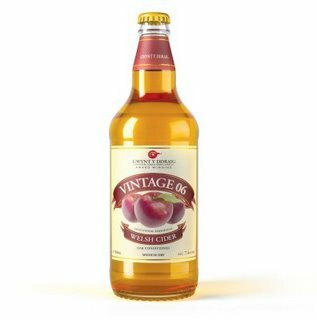 Vintage 06 is descibed by Operations Director Bill George as, “A blend of our very best cider apple varieties from the Autumn of 2006, fermented slowly and left to mature for twelve months before making its way to the bottle. A masterpiece of flavours to enjoy by itself, or as an accompaniment to any menu”. The cider is fermented in oak and is described as medium-dry. There is an open day coming up on the weekend of the 8th-9th August 2009, 1100-2100 Sat, 11-1900 Sun.